Incorporated in 1909. A home rule city governed by a mayor and city council comprised of five council members, all of whom are elected to staggered two-year terms. The chief administrative officer is the city manager who is appointed by the mayor with approval from the city council. Boerne is a full-service municipality, providing all the basic government services such as streets, police, fire, animal control, solid waste collection, electric, water, wastewater, gas, cemetery, library, parks, and recreation. CHAMBER & TOURISM: See full details in directory below. Hill Country Mile: Boerne economic development program: A stretch along Main Street of locally-owned specialty shops and restaurants through the historic heart of downtown. Historic Downtown Boerne: Stroll down Hauptstrasse (Main Street) to see the shops, restaurants and architecture from the late 1800s. Agricultural Heritage Center: Established in 1986, its mission is to educate current and future generations on the historic farming techniques, implements, tools and artifacts that were used in the Texas Hill Country. Cibolo Nature Center: A 100 acre center. Hiking trails are laid out to bring the visitor through four dramatically distinct eco-systems. The creek, marshland, meadow and woods each have a unique charm, and each has its owns set of plant and animal life to observe. Named one of the top ten hikes in Texas by Texas Monthly Magazine. Educational center and bookstore in a restored historic building. Cascade Caverns: A 105 acre park. Enjoy the cool comfort of 68 degree year round temperatures as you meander through underground pathways, huge cavern rooms and soaring cavern walls. Texas' only cavern with a 100' waterfall. Open year-round. An award winning natural attraction. Cave Without A Name: A natural living cavern filled with spectacular formations. Tour the 6 rooms in constant 66 degree comfort. Gallery, tours, adventure. Enchanted Springs Ranch: Authentic Old West town. This 86 acre working ranch excites visitors with its rugged natural beauty, collection of exotic animals, and authentic time warp - a Western town right out of the 1800s. Originally designed for Western movies, this old west town has 30 buildings and has already been used in several TV films and commercials. Tours, lodging, gift shop, chuck wagon dinner shows, wild west days and wagon rides. Exotic animal park. Cowboy Christmas. Also available for weddings and private parties. Daily visitors welcome. PARKS: There are many parks in the greater area as profiled on the Parks page. Jun: Boerne Berges Fest: downtown, www.bergesfest.com; Celebrate German heritage. Every 2nd Sat: Art, Wine & Chocolates: 4-8p, throughout town at the galleries. 830-249-1500. www.secondsaturdayartandwine.com. Map on web site. Free admission and trolley, wine tasting, hors d'oeuvres and specials. HISTORY: Handbook of Texas Online: "In 1849 a group of German colonists from Bettina camped on the north side of Cibolo Creek, about a mile west of the site of present Boerne. They called their new community Tusculum, after Cicero's home in ancient Rome. 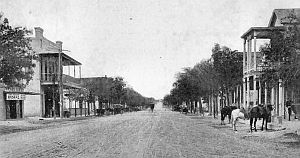 In 1852 Gustav Theissen and John James laid out the townsite and changed the name to Boerne in honor of Ludwig Boerne, a German author and publicist. A post office was established in 1856 with August Staffell as postmaster. The community had only ten houses in 1859, but it was chosen as county seat by a margin of sixty-seven votes after the county was established in 1862. A courthouse was built in 1870 and was still in use in the 1990s; it was thus the second-oldest courthouse in the state. 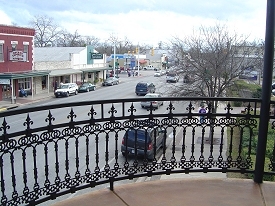 Boerne developed the reputation of having a very healthful environment and quickly became known as a health resort. By 1884 it had five hotels, assorted businesses, and 250 residents. Cotton, wool, and grain were the principal shipments, but timber, cedar posts, and building stone were also profitable commodities. 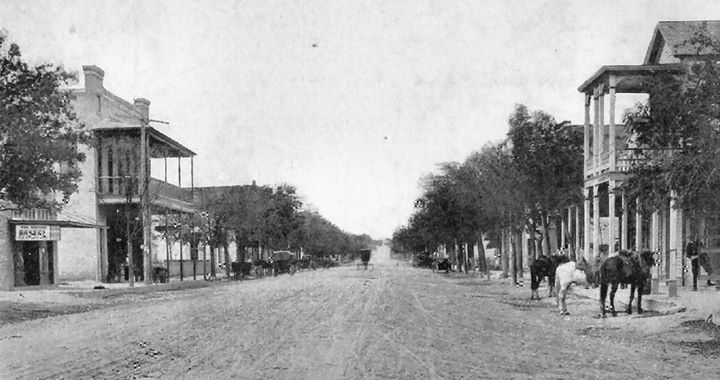 The arrival of the San Antonio and Aransas Pass Railway in 1887 brought increased economic opportunity, and by 1890 the population of Boerne had risen to 800. Boerne residents voted to incorporate in 1909 and established a mayor-alderman form of city government. Also in that year they established the Boerne Independent School District. The population was reported at 950 in 1914, and the community prospered through the 1920s. The Great Depression of the 1930s, however, all but put an end to the tourism and cotton farming that had been staples of the local economy. The population fell from an estimated 2,000 in 1928 to 1,117 in 1931; it had risen to only 1,271 by the 1940s. In the 1950s, however, many residents turned to nearby San Antonio for employment, and Boerne became a bedroom community. The population grew at a slow but steady rate, reaching 2,169 in 1960. In the 1960s construction in neighboring Bexar County of the San Antonio Medical Center and the University of Texas at San Antonio, as well as the completion of Interstate Highway 10, made Boerne even more attractive as a town from which to commute. Its population rose to 2,400 by 1970, 3,254 by 1980, 4,274 by 1990, and 6,178 by 2000." Named for Ludwig Boerne, a German author and publicist. Founded in 1852. Boerne Area Historical Preservation; and Genealogical Society Of Kendall County (the Family History Place): See full details in "Non-Profits" below. Within town, TX-46 is called River Rd. Locations in nearby Bergheim, 7 E of town, carry a Boerne postal address. Check "Boerne" listings at the Bergheim profile. Using a portable electronic device while driving in Boerne is illegal. The Trinity Aquifer (Cow Creek) supplies the water to Tapatio Springs, Ranger Creek, Cibolo Oaks Landing, Creekside Terrace, the Green Acres Subdivisions. BOERNE AREA ARTISTS ASSOCIATION (BAAA): 830-249-7277; www.boerneart.com. Artists and galleries in Boerne welcome you to explore their diversified art community and shop for art work. Host Parade of Artists in April and the Hill Country Invitational Art Show in October. BOERNE ART AL FRESCO: 830-248-1617; Boerne, TX 78006www.artalfresco.org. A public art program created by the City of Boerne that brings together community and tourism with a vision and dedication to the arts. BOERNE PROFESSIONAL ARTISTS (BPA): Boerne, TX 78006. http://boerneprofessionalartists.com. Sponsors the Parade of Artists,an annual 3 day festive event held each spring when hundreds of art patrons from around the country visit various art venues in Boerne. The BPA conducts the Saturday BoerneFest Art show and designs a poster for the annual event. BPA sponsors the monthly event, 2nd Saturday Art and Wine, where art galleries provide hors d’oeuvres and refreshments from 4-8p with a free trolley connecting the various venues. (THE) HILL COUNTRY COUNCIL FOR THE ARTS: 210-857-5997; POB 2024, Boerne, TX 78006. www.hccarts.org. Mission is to develop and sustain an environment that supports and promotes awareness, appreciation, education and access to all the Arts. As a 501c3 nonprofit organization we strive to be an inclusive resource for all the arts, artists, arts organizations, and supporters of the Arts throughout the Texas Hill Country. Formerly Cibolo Arts Council. LINDA CHALBERG: Boerne, TX 78006. www.lindachalberg.com. Whether the subject is flowers, gardens, historical structures, village scenes, vistas or unique market settings, Linda enjoys the challenge of working out a composition and the enjoyment of putting paint on paper. HERTZ: 830-755-2270; 31480 IH-10 W, Boerne, TX 78006. www.hertz.com. Vehicle rental. ACACIA LANDSCAPE & DESIGN: 830-981-5296; 32005 IH-10 E, Boerne, TX 78006. www.acacialandscapeanddesign.com. AUTHENTIC CUSTOM HOMES: 830-816-7100; 1002 River Rd, Ste 100, Boerne, TX 78006. www.achomes.com. DYNAMIC ENVIRONMENTS: 830-249-7525; Boerne, TX 78006. www.dynamicenvironments.com. Landscape architects & contractors. ROBERT S THORNTON - GREAT HOMES: 830-249-3646; 507 E Blanco, Boerne, TX 78006. www.rsthornton.com. FAIR OAKS RANCH GOLF & COUNTRY CLUB: 210-582-6720; 7900 Fair Oaks Pkwy, Fair Oaks Ranch, TX 78015. www.fairoaksclub.com. Private, 36 holes (Blackjack & Live Oak), 7000 yds, par 72, 1 mi from Boerne. (THE) RANGE AT LEON SPRINGS: 210-698-2277; 26254 IH-10 W, Boerne, TX 78006. www.therangeatleonsprings.com. Practice facility. TAPATIO SPRINGS GOLF & RESORT CENTER: 830-537-4611; 800-999-3299; 314 Blue Heron Blvd, Boerne, TX 78006. www.tapatio.com. Three 9 hole courses (Lakes, Valley, Ridge), 27 holes total. Golf resort, conference center, luxury gated community. FAIR OAKS RANCH: Started as a development of homes and a Country Club in what had previously been a large working ranch and over time became a city. The original large, 5,000 acre, ranch was founded in the 1930's by oil man, Ralph E. Fair. After the deaths of both Mr. Fair and his wife by 1969, the remaining family began to develop the Ranch as a community of various sizes of homes. By 1975, a homeowners association was begun to help maintain the beauty and development of the Ranch. By 1985, incorporation was sought. State laws required two cities to be made - Fair Oaks Ranch South and Fair Oaks Ranch North. Finally, On January 21, 1988, the North and South cities were combined and named Fair Oaks Ranch. The 2010 Census reported a population of 5,986 with over 1,800 homes. Mission is to protect children, the elderly, and people with disabilities from abuse, neglect, and exploitation by involving clients, families, and communities. TEXAS HILL COUNTRY TRAIL REGION: 830-739-1362; 3935 IH-10 W, Ste 3, Boerne, TX 78006. www.txhillcountrytrail.com. An opportunity to learn more about heritage sites cities and attractions to build your own itinerary and plan your adventure today. Provided by the Texas Historical Commission, Texas Heritage Trails Program. Local resources: Game Wardens: Chavez, David O: 830-928-2921; Jenkins, Kirk C: 830-928-7392. Offices with Sheriff, 830-249-9721. BOERNE POOL SUPPLIES: 830-249-7171; 1224 S Main St, Boerne, TX 78006. www.boernepoolsupplies.com. BEASOM STABLE: 830-755-4903, 9 Spring Hill Dr, Boerne, TX 78611. www.beasomstable.com. Formerly Victory Lane Farm. Boarding and training services. BOERNE STABLES: 210-326-5290; 25 Zoeller Ln, Boerne, TX 78611. Facebook. A traditional boarding stable with monthly or nightly arrangements, with pasture turn-out, paddocks, stalls, wash-docks, horse grooming area, round pen, hot-walker. Trainer on-site, and a few RV spots. No horse rides or trails. KINSWOOD FARMS: 830-336-4474; 539 TX-46 E, Boerne, TX 78611. No web site. Equestrian facilities on 100 acres, dozens of horses, stable, barn, training, dressage, eventing, boarding, lessons. MICHAEL HUNSINGER HORSE TRAINING: 615-594-7369; 43000A IH-10 W, Boerne, TX 78611. OPEN T.R.A.I.L. RANCH: 210-367-8248; 28710 Boerne Stage Rd, Boerne, TX 78611. www.opentrailranch.org. Our therapeutic riding programs help those with special needs reach their highest potential, gain self-confidence, and self-esteem, through equine-oriented activities in a safe and positive hill country environment. As a non-profit organization, we strive to give our horses the best care, while working to expand and provide our students the best possible experience. We use the latest teaching techniques to help our students learn, and only use instructors that are Path Intl. certified and possess wonderful interaction abilities. RUSSELL EQUESTRIAN CENTER: 210-698-3210; 24850 Scenic Loop Rd, San Antonio/Boerne, TX 78255. www.russellequestriancenter.com. 57 acre facility located just NW of San Antonio, and offers three sand arenas, wooded trails, cross country jumps and plenty of open space for hacking. Five large turnout areas. 24 hour manned facility include spacious 12 x 12 box stalls, a convenient tack room providing boarders with personal lockers for storing equipment, and wash areas with hot and cold water. You can comfortably watch the many activities from the large windowed lounge area. A full service barn, offering various care packages, lessons, shows and horses for sale. SISTERCREEK RANCH: 830-324-6525; 1818 FM-1376, Boerne TX 78006 (but located 6 mi N of Sisterdale). http://sistercreekranch.com. Owners of this 700-acre working ranch have tailored it to be a perfect spot for horse owners to enjoy themselves to the fullest. No horse rentals, you must bring your own horses. Full and pasture boarding. Upscale guest houses, saloon, barn, arena, round pen, and lots of horse riding trails, hiking, catch and release fishing, and great spots for cooling off in the creeks. Available for corporate retreats, meetings, weddings and private parties. Spa services. Tennessee Walker trail horses for sale. All trailers and rv's must be gray and black water self-contained. No drop-ins, ranch is gated and requires security code. FAIRFIELD INN & SUITES: 830-368-4167; 6 Cascade Caverns, IH-10 W, Boerne, TX 78006. www.boernefairfieldinn.com. LA QUINTA INN & SUITES: 830-249-1212; 36756 IH-10 W, Boerne, TX 78006. www.lg.com. ALLERGY & ASTHMA CENTER: 830-249-0633; 109 Falls Ct, Ste 100, Boerne, TX 78006. HILL COUNTRY MISSION FOR HEALTH: 830-249-0130; 122 Commerce Ave, Boerne, TX 78006. www.missionforhealth.org. A non-profit medical ministry providing charitable primary healthcare for eligible low-income, uninsured adults residing in Kendall County and surrounding communities through strong non-governmental support. Available to ages 18-64. Open by apmt, 9a-5p Mon-Tue, Thurs, and 9a-7p Wed. See eligibility requirements. ANY LAB TEST NOW: 830-730-7777; 1369 S Main St, # 105, Boerne, TX 78006. www.anylabtestnow.com/franchises/boerne-78006. Retail Clinical Collection Lab. HILL COUNTRY PREGNANCY CARE CENTER: 24 Hour Helpline: 800-395-4357; Admin: 830-249-9717; 439 Fabra, Boerne, TX 78006. www.lifesprecious.org. Free pregnancy & STD testing, sonograms, education on pregnancy, abortion alternatives, adoption and abstinence, post-abortion lay counseling. MONARCH PHYSICAL THERAPY: 830-431-0773; 28604 IH-10 W, Ste 4, Boerne, TX 78006. http://www.monarchpt.com. AKIN, DOHERTY, KLEIN & FEUGE: 830-815-1100; 507 E Blanco, Ste 101, Boerne, TX 78006. www.adkf.com. BOERNE COOKING COTTAGE: 830-331-4151; 140 E Bandera Rd, Boerne, TX 78006. www.boernecookingcottage.com. Cooking classes. CARO PARTY RENTALS, LLC: 830-331-9802; 113 S Plant Ave, Ste C, Boerne, TX 78006. http://caropartyrentals.com. CASCADE CAVERNS: 830-755-2400; IH-10, exit # 543, 226 Cascade Caverns Rd, Boerne, TX 78015. www.cascadecaverns.com. A 105 acre park. Enjoy the cool comfort of 68 degree year round temperatures as you mender through underground pathways, huge cavern rooms and soaring cavern walls. Texas' only cavern with a 100' waterfall. Open Year Round. An award winning natural attraction. 100+ RV camp sites with full hook ups. CAVE WITHOUT A NAME: 888-839-2283; 325 Kreutzberg Rd, Boerne, TX 78006. www.cavewithoutaname.com. COOK WINSTON & COMPANY: 830-248-1145; 216 E Blanco, Boerne, TX 78006. www.cookwinston.com. Acquisition and appraisal of firearms. CORPORATE TRANSPORTATION SERVICE: 210-698-7799; 210-821-5466; 866-696-7799; 25840 IH-10 W, Boerne, TX 78006. www.ctssa.com, www.blacktielimobizinc.com. Corporate Events, Airport Transfers, Customized Wine Tours in Limo Coaches, Weddings, San Antonio Tours Missions, Ranch Tours, Site Visits, Hill Country Golf, Spurs Games, World Affiliate Network, Concierge Service. CROSSFIRE GYMNASTICS: 830-816-5212; Boerne, TX 78006. EDWARD JONES: 830-249-8286; 215 W Bandera Rd, Ste 113B, Boerne, TX 78006. www.edwardjones.com. Financial services. ENCHANTED SPRINGS RANCH: 830-249-8222; 242 TX-46 W, Boerne, TX 78006. www.enchantedspringsranch.com. Authentic Old West town. This 86 acre working ranch excites visitors with its rugged, natural beauty, collection of exotic animals, and authentic time warp - a Western town right out of the 1800s. Originally designed for Western movies, this old west town has 30 buildings and has already been used in several TV films and commercials. Weddings, private parties, gift shop, wagon rides. Exotic animal park. EXPLORE MAGAZINE: 210-507-5250; 265 N Main, Ste C, Boerne, TX 78006. www.hillcountryexplore.com. Published by SMV Texas, LLC, regarding arts & entertainment in Kendall County. Monthly paid subscription. HEARTS' HOME ACOUSTICS: 830-331-9840; 109 Oak Park Dr, Boerne, TX 78006. www.heartshomeacoustics.com. Fine stringed instruments & instructions. LOCKAWAY STORAGE: 830-201-0956; 29620 IH-10 W, Boerne, TX 78006-9108. www.lockaway-storage.com THE LODGE AT LEON SPRINGS: 2106989821; 24137 Boerne Stage Rd, San Antonio, TX 78255. https://thelodgeatleonsprings.com. For Profit The Lodge is a unique, licensed assisted living residence for seniors desiring assistance with tasks of daily living. It has been family owned and operated since 1996. With a commitment to quality, our exceptional staff provides personalized care and individualized attention, 24 hours a day, 7 days per week. Our peaceful setting and low staff-to-resident ratio allow residents to experience a warm and loving community. Respite care is also available. Conveniently located near Boerne, TX, The Lodge residents enjoy the comfort of a spacious, 12,000 sq.ft., Spanish-style home, as well the natural beauty of the historical grounds. Daily activities are designed to promote health and well-being and foster socialization. LONESTAR COLLECTIVE DANCE: 830-336-3877; 635 TX-46 E, #104, Boerne, TX 78006. www.lonestarcollective.com. OAK HILLS PEST CONTROL: 830-249-3575; 107 Pkwy, Boerne, TX 78006. www.oakhillspestcontrol.com. REWBY BOUTIQUE & SALON: 830-331-8605; 322 S Main, Boerne, TX 78006. www.rewbystyle.com. STILL WATER SPORTS CAMPS: 881-361-2631; 624 N Main St, Boerne, TX 78006. www.stillwatersportscamp.com. Summer camps held at rental facilities in Blanco, TX, Leakey, TX and Pagosa Springs, CO.
TOUDANINES CLEANERS: 830-249-3328; 1430 S Main, Ste 103, Boerne, TX 78006. www.toudaninescleaners.com. BOERNE BUSINESS ALLIANCE: 888-500-0890; 215 W Bandera Rd, #114-445, Boerne, TX 78006. http://shopboernefirst.com. Dedicated to promoting Boerne as a retail, dining, and entertainment center; and to the maintaining of local businesses, enhancing communication among business owners, maintain the charm and historical presence of downtown Boerne, and in the process, giving back to local charitable organizations and needs within our community. BOERNE COMMUNITY THEATRE: 830-249-9166; 907 E Blanco, Boerne, TX 78006. www.boernetheatre.org. The nonprofit community theatre of Boerne since 1991. Presents five regular productions, two Teen Troupe shows, three children's drama camps and a Spring Special. BOERNE EDUCATION FOUNDATION: http://boerneeducationfoundation.org. A non-profit 501(c)3 corporation formed in 1997 to support Boerne schools. BEF raises money and accepts gifts to be distributed to schools within Boerne ISD. The goal of the foundation is to provide funds beyond the normal operating budget to improve student achievement and to recognize and encourage teaching excellence. (THE) BOERNE HISTORIC HOMES TOUR: 830-249-7277; Boerne, TX 78006. www.imagesboerne.com/culture. Managed by the above Boerne Convention Center and Visitors Bureau. BOERNE LIFE CENTER GOLDEN RULE SERVICES, INC: 830-331-1051; 123 Pecan St, Boerne, TX 78006. www.goldenruleservices.org. Provides opportunities to individuals with intellectual disabilities for growth and independence in their community. (THE) BOERNE TURN VEREIN: 830-249-2271; 221 E Theissen, Boerne, TX 78006. A 100+ year old membership club, with open bowling to the public, and welcomes new members. Party rentals. CIBOLO NATURE CENTER NATURE CAMP & ART CAMP: 830-249-4616, 140 City Park Rd, Boerne TX 78006. www.cibolo.org. A 100 acre center with hiking trails are laid out to bring the visitor through four dramatically distinct eco-systems. The creek, marshland, meadow and woods each have a unique charm, and each has its owns et of plant and animal life to observe. Named one of the top ten hikes in Texas by Texas Monthly Magazine. Educational center and bookstore in a restored historic building. Concerts semi-monthly. COW CREEK GROUNDWATER CONSERVATION DISTRICT: 830-816-2504; 201 E San Antonio Ave, Ste 100, and 216 Market Ave, Ste 105, Boerne, TX 78006. www.ccgcd.org. Created for the purpose of conserving, preserving, recharging, protecting and preventing waste of groundwater from the aquifers within Kendall County. The District will conduct administrative and technical activities and programs to achieve these purposes. GREATER BOERNE CHAMBER OF COMMERCE: Ofc: 830-249-8000; Fax: 830-249-9639; 121 S Main St, Boerne, TX 78006. HILL COUNTRY DAILY BREAD MINISTRIES: 830-249-0025; 38 Cascade Caverns, Boerne, TX 78006. http://hillcountrydailybread.com. A Christian non-profit who's mission is to transform the lives of our neighbors in poverty through a collaboration with churches, agencies, sponsors, and ordinary people who know first hand that each of us has the power to help change a life. Our process is designed to foster long-term, meaningful Christian centered relationships between people in need and people who are called to help. Family to family, neighbor to neighbor, a community united to end situational and generational poverty in our hometown. HILL COUNTRY FAMILY SERVICES: 830-249-8643; 114 W Advogt, Boerne, TX 78006. www.hcfamilysvcs.org. Provides counseling, food, clothing and emergency financial assistance to Kendall County families in need. Empowers clients by assisting them in making healthy lifestyle choices and provides a connection to other community services and resources. A United Way agency and 2-1-1 Texas information provider. KENDALL COUNTY FAIR ASSOCIATION: 830-249-2839; 840 Adler St, Boerne, TX 78006. www.kcfa.org. As a nonprofit organization, KCFA strives to promote agricultural education, leadership and agricultural entrepreneurship; encourage and recognize the achievement of youth in agricultural, horticultural and livestock management as they also encourage youth academic achievement and leadership experiences, promote the involvement of women in business, nutrition and home based businesses, encourage agricultural, horticultural and livestock related industries and other community nonprofit and civic interests toward positive rural economic development within the whole of the Hill Country community. KENDALL COUNTY WOMEN'S SHELTER (KCWS): 830-331-1001; HOT Line: 800-495-8078; 830-331-8950; 930 N School St, POB 1087, Boerne, TX 78006. www.kcwstexas.org. Provides safe, emergency shelter in a supportive environment where Texas Hill Country victims of domestic violence and their children can begin the healing process and receive the support services they need to build new lives. If you are in need of assistance, Residential Specialists are available 24/7 to take your call. KCWS ADMINISTRATIVE OFFICE: 830-331-8950; 930 N School St, POB 1087, Boerne, TX 78006. Also see thrift store below in Retail section and on Comfort page. LEADERSHIP BOERNE: http://leadershipboerne.org. A community Leadership program aimed at increasing the leadership pool for the present and future of the Boerne area. Sponsored by the Boerne Chamber of Commerce. Local: Hill Country Optimist of Kendall County, http://hillcountryoptimist.org. 830-331-4094; Meets in Boerne. RAINBOW SENIOR CENTER AT KRONKOSKY PLACE: 830-249-2114; 17 Old San Antonio Rd, Boerne, TX 78006. www.rainbowseniorcenter.com. For active adults 55. Offers many daily activities such as dominoes, bridge, Sit and Be Fit, a comprehensive Physical Fitness Center designed for those over 55, art class, computer classes, care giver support groups. STILL WATER: 888-361-2631; POB 1885, Boerne, TX 78006. www.stillwatersportscamp.com. A non-profit over-night summer sports/adventure/leadership camp organization that brings together kids from every type of background in a setting where they can all have first time experiences together both in adventure and the love of Christ. Open for ages 5-18. Camp facilities are rented in Blanco, TX, Leakey, TX, and Pagosa Springs, CO.
TEXAS FARM BUREAU - KENDALL COUNTY: 830-249-8837; 1 Sisterdale Rd, Boerne, TX 78006. Note: See separate listing sections for horses, riding, equestrian, and other animal care. PARTLOW PROPERTIES & INVESTMENTS: 830-816-5800; 624 N Main St, Ste 101, Boerne, TX 78006. www.partlowproperties.com. JPC MORTGAGE: 830-816-2721; 217 E Bandera, Ste 2, Boerne, TX 78006. www.jpfinancial.com. (THE) BRISTOW OF UPPER BALCONES: See Casadomaine builders above. TEXAS INVESTORS TITLE: 830-815-5888; 101 S Main St, Ste C, Boerne, TX 78006. www.texasivestorstitle.com. BOERNE EPICURE GOURMET MARKET: 830-331-9355; 210 S Main St, Boerne, TX 78006. www.boerneepicure.com. LIMESTONE GRILLE & TAVERN (YE KENDALL INN): 800-364-2138; 830-249-2138; 128 W Blanco, Boerne, TX 78006. www.yekendallinn.com. WHATABURGER: 830-249-1288; 621 Bandera Rd, Boerne, TX 78006. www.whataburger.com. CALAMITY JANE'S TRADING COMPANY: 830-249-0081; 404 S Main St, Boerne, TX 78006. www.calamityjanestradingco.com. OF A MUSE: 830-331-9455; 233 S Main St, Ste B, Boerne, TX 78006. http://ofamuse.com. Clothing and more. (THE) SQUIRREL'S RESALE NEST: 830-331-1366; 255 S Main St, Boerne, TX 78006. www.wildlife-rescue.org. Resale shop in Boerne, all proceeds benefit Wildlife Rescue & Rehabilitation in Kendalia. A family-owned, community-based business that sells RVs and boats, and parts and services. With multiple locations, we're the #1 RV and boat dealer in South Texas striving to service and sell an excellent buying experience. Dealerships in Houston, Boerne, Lamarque, Rockport and Donna. We specialize in RVs, 5th wheels, travel trailers, toy haulers, motorhomes, park trailers, boats & motors. Come see us! AMBLESIDE SCHOOL OF BOERNE: 830-388-8865; 210 Turner Ave, Boerne, TX 78006. http://amblesideboerne.com. On campus of St John Lutheran Church. APPLETREE DAY SCHOOL: 830-981-4343; 18 Scenic Loop Rd, Ste 100, Boerne, TX 78006. Private school. BCFS: 830-331-8908; 216 W Highland Dr, Boerne, TX 78006. Open Mon-Fri, 8a-4p. www.discoverbcfs.net. A non-profit health and human service organization, including education and Head Start program initiatives. HILL COUNTRY DAY SCHOOL: 830-438-8504; 31375 FM-3351, Fair Oaks Ranch/Boerne, TX 78015. www.hccfairoaks.org. Christian curriculum and programs for infant through 1st grade. Nearest service office: Boerne: 1201 S Main St, Ste 101. Serves Boerne, electric and fiber-based internet. GVTC: 830-885-4411; 800-367-4882; 36101 FM-3159, New Braunfels, TX 78132-5900. http://gvtc.com. Cable, Telephone and Internet. SAINT TRYPHON FARM & VINEYARDS: 830-777-6704; 24 Wasp Creek Rd, Boerne, TX 78006. www.sainttryphon.com. Pronounced "tree-fon"